As pre se ntly configure d, the national security institutions of the U.S. government are still the institutions constructed to win the Cold War. The United States confronts a very different world today. Instead of facing a few very dangerous adversaries, the United States confronts a number of less visi- ble challenges that surpass the boundaries of traditional nation-states and call for quick, imaginative, and agile responses. The men and women of theWorldWar II generation rose to the challenges of the 1940s and 1950s.They restructured the government so that it could protect the country. That is now the job of the generation that experienced 9/11. Those attacks showed, emphatically, that ways of doing business rooted in a dif- ferent era are just not good enough. Americans should not settle for incremen- tal, ad hoc adjustments to a system designed generations ago for a world that no longer exists. We recommend significant changes in the organization of the government. We know that the quality of the people is more important than the quality of the wiring diagrams. Some of the saddest aspects of the 9/11 story are the out- standing efforts of so many individual officials straining, often without success, against the boundaries of the possible. Good people can overcome bad struc- tures.They should not have to. o strengthening the FBI and homeland defenders. Much of the public commentary about the 9/11 attacks has dealt with "lost opportunities," some of which we reviewed in chapter 11.These are often char- acterized as problems of "watchlisting," of "information sharing," or of "con- necting the dots." In chapter 11 we explained that these labels are too narrow. They describe the symptoms, not the disease. In each of our examples, no one was firmly in charge of managing the case and able to draw relevant intelligence from anywhere in the government, assign responsibilities across the agencies (foreign or domestic), track progress, and quickly bring obstacles up to the level where they could be resolved. Respon- sibility and accountability were diffuse. The agencies cooperated, some of the time. But even such cooperation as there was is not the same thing as joint action.When agencies cooperate, one defines the problem and seeks help with it.When they act jointly, the problem and options for action are defined differently from the start. Individuals from different backgrounds come together in analyzing a case and planning how to manage it. that assigns roles to help them execute as a team? Since 9/11, those issues have not been resolved. In some ways joint work has gotten better, and in some ways worse.The effort of fighting terrorism has flooded over many of the usual agency boundaries because of its sheer quan- tity and energy. Attitudes have changed. Officials are keenly conscious of try- ing to avoid the mistakes of 9/11. They try to share information. They circulate-even to the President-practically every reported threat, however dubious. Partly because of all this effort, the challenge of coordinating it has multi- plied. Before 9/11, the CIA was plainly the lead agency confronting al Qaeda. The FBI played a very secondary role.The engagement of the departments of Defense and State was more episodic. with other parts of the Justice Department. fied commands, each headed by a four-star general, have counterter- rorism as a primary mission: Special Operations Command, Central Command (both headquartered in Florida), and Northern Command (headquartered in Colorado). resources in border and transportation security, along with analysis of domestic vulnerability and other tasks. we described in chapter 12.
joined by a parallel presidential advisory structure, the Homeland Security Council. So far we have mentioned two reasons for joint action-the virtue of joint planning and the advantage of having someone in charge to ensure a unified effort.There is a third: the simple shortage of experts with sufficient skills.The limited pool of critical experts-for example, skilled counterterrorism analysts and linguists-is being depleted. Expanding these capabilities will require not just money, but time. The U.S. government cannot afford so much duplication of effort.There are not enough experienced experts to go around.The duplication also places extra demands on already hard-pressed single-source national technical intelligence collectors like the National Security Agency. informed by analysis of intelligence from all sources, in two ways. structed their own interagency entities and task forces in order to get cooperation. The Counterterrorist Center at CIA, for example, recruits liaison officers from throughout the intelligence community. The military's Central Command has its own interagency center, recruiting liaison officers from all the agencies from which it might need help.The FBI has Joint Terrorism Task Forces in 84 locations to coordinate the activities of other agencies when action may be required. the White House, where the NSC staff tries to play this role. The national security staff at theWhite House (both NSC and new Home- land Security Council staff) has already become 50 percent larger since 9/11. But our impression, after talking to serving officials, is that even this enlarged staff is consumed by meetings on day-to-day issues, sift- ing each day's threat information and trying to coordinate everyday operations. Even as it crowds into every square inch of available office space, the NSC staff is still not sized or funded to be an executive agency. In chapter 3 we described some of the problems that arose in the 1980s when a White House staff, constitutionally insulated from the usual mechanisms of oversight, became involved in direct operations. During the 1990s Richard Clarke occa- sionally tried to exercise such authority, sometimes successfully, but often caus- ing friction. Yet a subtler and more serious danger is that as the NSC staff is consumed by these day-to-day tasks, it has less capacity to find the time and detachment needed to advise a president on larger policy issues. That means less time to work on major new initiatives, help with legislative management to steer needed bills through Congress, and track the design and implementation of the strategic plans for regions, countries, and issues that we discuss in chapter 12.
operations, it becomes harder to play all the position's other roles, including that of analyst in chief. The problem is nearly intractable because of the way the government is cur- rently structured. 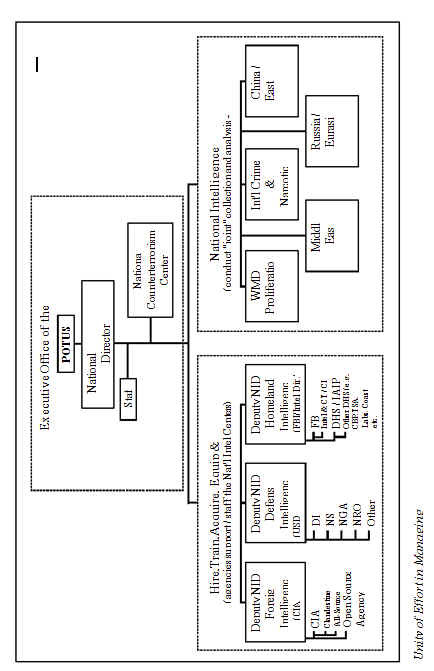 Lines of operational authority run to the expanding execu- tive departments, and they are guarded for understandable reasons: the DCI commands the CIA's personnel overseas; the secretary of defense will not yield to others in conveying commands to military forces; the Justice Department will not give up the responsibility of deciding whether to seek arrest warrants. But the result is that each agency or department needs its own intelligence apparatus to support the performance of its duties. It is hard to "break down stovepipes" when there are so many stoves that are legally and politically enti- tled to have cast-iron pipes of their own. Recalling the Goldwater-Nichols legislation of 1986, Secretary Rumsfeld reminded us that to achieve better joint capability, each of the armed services had to "give up some of their turf and authorities and prerogatives. "Today, he said, the executive branch is "stove-piped much like the four services were nearly 20 years ago." He wondered if it might be appropriate to ask agencies to "give up some of their existing turf and authority in exchange for a stronger, faster, more efficient government wide joint effort. "3 Privately, other key offi- cials have made the same point to us. We therefore propose a new institution: a civilian-led unified joint com- mand for counterterrorism. It should combine strategic intelligence and joint operational planning. In the Pentagon's Joint Staff, which serves the chairman of the Joint Chiefs of Staff, intelligence is handled by the J-2 directorate, operational planning by J-3, and overall policy by J-5. Our concept combines the J-2 and J-3 functions (intelligence and operational planning) in one agency, keeping overall policy coordination where it belongs, in the National Security Council. Recommendation: We recommend the establishment of a National Counterterrorism Center (NCTC), built on the foundation of the existing Terrorist Threat Integration Center (TTIC). Breaking the older mold of national government organization, this NCTC should be a center for joint operational planning and joint intelligence, staffed by personnel from the various agencies. The head of the NCTC should have authority to evaluate the performance of the people assigned to the Center. the military's creation of unified joint commands, or the shaping of earlier national agencies like the National Reconnaissance Office, which was formed to organize the work of the CIA and several defense agencies in space. NCTC-Intelligence. The NCTC should lead strategic analysis, pooling all-source intelligence, foreign and domestic, about transna- tional terrorist organizations with global reach. It should develop net assessments (comparing enemy capabilities and intentions against U.S. defenses and countermeasures). It should also provide warning. It should do this work by drawing on the efforts of the CIA, FBI, Homeland Security, and other departments and agencies. It should task collection requirements both inside and outside the United States. structure and remain distinct, as a national intelligence center, within the NCTC. As the government's principal knowledge bank on Islamist terrorism,with the main responsibility for strategic analysis and net assessment, it should absorb a significant portion of the analytical talent now residing in the CIA's Counterterrorist Center and the DIA's Joint Intelligence Task Force-Combatting Terrorism (JITF-CT). NCTC-Operations. The NCTC should perform joint planning. structure.The NCTC can draw on analogous work now being done in the CIA and every other involved department of the government, as well as reaching out to knowledgeable officials in state and local agencies throughout the United States. planning should follow the policy direction of the president and the National Security Council. these individuals. Informed by this analysis, the NCTC would then organize and plan the management of the case, drawing on the talents and differing kinds of experience among the several agency represen- tatives assigned to it-assigning tasks to the CIA overseas, to Homeland Security watching entry points into the United States, and to the FBI. If military assistance might be needed, the Special Operations Com- mand could be asked to develop an appropriate concept for such an operation.The NCTC would be accountable for tracking the progress of the case, ensuring that the plan evolved with it, and integrating the information into a warning.The NCTC would be responsible for being sure that intelligence gathered from the activities in the field became part of the government's institutional memory about Islamist terrorist personalities, organizations, and possible means of attack. In each case the involved agency would make its own senior man- agers aware of what it was being asked to do. If those agency heads objected, and the issue could not easily be resolved, then the disagree- ment about roles and missions could be brought before the National Security Council and the president. president, and should be equivalent in rank to a deputy head of a cabinet department.The head of the NCTC would report to the national intelligence director, an office whose creation we recommend below, placed in the Exec- utive Office of the President.The head of the NCTC would thus also report indirectly to the president.This official's nomination should be confirmed by the Senate and he or she should testify to the Congress, as is the case now with other statutory presidential offices, like the U.S. trade representative. little real power, the head of the NCTC must have the right to con- cur in the choices of personnel to lead the operating entities of the departments and agencies focused on counterterrorism, specifically including the head of the Counterterrorist Center, the head of the FBI's Counterterrorism Division, the commanders of the Defense Department's Special Operations Command and Northern Com- mand, and the State Department's coordinator for counterterrorism.5 The head of the NCTC should also work with the director of the Office of Management and Budget in developing the president's counterterrorism budget. while preserving an agency's operational control. In the international context, NATO commanders may get line authority over forces assigned by other nations. In U.S. unified commands, commanders plan operations that may involve units belonging to one of the serv- ices. In each case, procedures are worked out, formal and informal, to define the limits of the joint commander's authority. The most serious disadvantage of the NCTC is the reverse of its greatest virtue. The struggle against Islamist terrorism is so important that any clear-cut cen- tralization of authority to manage and be accountable for it may concentrate too much power in one place. The proposed NCTC would be given the authority of planning the activities of other agencies. Law or executive order must define the scope of such line authority. The NCTC would not eliminate interagency policy disputes.These would still go to the National Security Council.To improve coordination at theWhite House, we believe the existing Homeland Security Council should soon be merged into a single National Security Council.The creation of the NCTC should help the NSC staff concentrate on its core duties of assisting the pres- ident and supporting interdepartmental policymaking. We recognize that this is a new and difficult idea precisely because the authorities we recommend for the NCTC really would, as Secretary Rums- feld foresaw, ask strong agencies to "give up some of their turf and authority in exchange for a stronger, faster, more efficient government wide joint effort." Countering transnational Islamist terrorism will test whether the U.S. govern- ment can fashion more flexible models of management needed to deal with the twenty-first-century world. An argument against change is that the nation is at war, and cannot afford to reorganize in midstream. But some of the main innovations of the 1940s and 1950s, including the creation of the Joint Chiefs of Staff and even the construc- tion of the Pentagon itself, were undertaken in the midst of war. Surely the country cannot wait until the struggle against Islamist terrorism is over. "Surprise, when it happens to a government, is likely to be a complicated, diffuse, bureaucratic thing. It includes neglect of responsibility, but also respon- sibility so poorly defined or so ambiguously delegated that action gets lost. "6 That comment was made more than 40 years ago, about Pearl Harbor.We hope another commission, writing in the future about another attack, does not again find this quotation to be so apt. In our first section, we concentrated on counterterrorism, discussing how to combine the analysis of information from all sources of intelligence with the joint planning of operations that draw on that analysis. In this section, we step back from looking just at the counterterrorism problem. We reflect on whether the government is organized adequately to direct resources and build the intelligence capabilities it will need not just for countering terrorism, but for the broader range of national security challenges in the decades ahead. During the Cold War, intelligence agencies did not depend on seamless inte- gration to track and count the thousands of military targets-such as tanks and missiles-fielded by the Soviet Union and other adversary states. Each agency concentrated on its specialized mission, acquiring its own information and then sharing it via formal, finished reports.The Department of Defense had given birth to and dominated the main agencies for technical collection of intelli- gence. Resources were shifted at an incremental pace, coping with challenges that arose over years, even decades. We summarized the resulting organization of the intelligence community in chapter 3. It is outlined below. gence is still organized around the collection disciplines of the home agencies, not the joint mission. The importance of integrated, all- source analysis cannot be overstated.Without it, it is not possible to "connect the dots." No one component holds all the relevant infor- mation. leadership of the intelligence community should be able to pool infor- mation gathered overseas with information gathered in the United States, holding the work-wherever it is done-to a common stan- dard of quality in how it is collected, processed (e.g., translated), reported, shared, and analyzed. A common set of personnel standards for intelligence can create a group of professionals better able to oper- ate in joint activities,transcending their own service-specific mind-sets. was once "central" to our national intelligence capabilities, following the end of the Cold War it has been less able to influence the use of the nation's imagery and signals intelligence capabilities in three national agencies housed within the Department of Defense: the National Security Agency, the National Geospatial-Intelligence Agency, and the National Reconnaissance Office. One of the lessons learned from the 1991 Gulf War was the value of national intelligence systems (satellites in particular) in precision warfare. Since that war, the department has appropriately drawn these agencies into its trans- formation of the military. Helping to orchestrate this transformation is the under secretary of defense for intelligence, a position established by Congress after 9/11. An unintended consequence of these devel- opments has been the far greater demand made by Defense on tech- nical systems, leaving the DCI less able to influence how these technical resources are allocated and used. organized around what they collect or the way they collect it. But the priorities for collection are national. As the DCI makes hard choices about moving resources, he or she must have the power to reach across agencies and reallocate effort. run a particular agency, the CIA. He is expected to manage the loose confederation of agencies that is the intelligence community. He is expected to be the analyst in chief for the government, sifting evi- dence and directly briefing the President as his principal intelligence adviser. No recent DCI has been able to do all three effectively. Usu- ally what loses out is management of the intelligence community, a difficult task even in the best case because the DCI's current author- ities are weak.With so much to do, the DCI often has not used even the authority he has. rounding the intelligence community have accumulated to a depth that practically defies public comprehension.There are now 15 agen- cies or parts of agencies in the intelligence community.The commu- nity and the DCI's authorities have become arcane matters, understood only by initiates after long study. Even the most basic information about how much money is actually allocated to or within the intelligence community and most of its key components is shrouded from public view. The only budget power of the DCI over agencies other than the CIA lies in coordinating the budget requests of the various intelligence agencies into a single program for submission to Congress.The overall funding request of the 15 intelligence entities in this program is then presented to the president and Congress in 15 separate volumes. When Congress passes an appropriations bill to allocate money to intelli- gence agencies, most of their funding is hidden in the Defense Department in order to keep intelligence spending secret.Therefore, although the House and Senate Intelligence committees are the authorizing committees for funding of the intelligence community, the final budget review is handled in the Defense Subcommittee of the Appropriations committees.Those committees have no subcommittees just for intelligence, and only a few members and staff review the requests. We have received recommendations on the topic of intelligence reform from many sources. Other commissions have been over this same ground.Thought- ful bills have been introduced, most recently a bill by the chairman of the House Intelligence Committee Porter Goss (R-Fla.), and another by the rank- ing minority member, Jane Harman (D-Calif.). In the Senate, Senators Bob Graham (D-Fla.) and Dianne Feinstein (D-Calif.) have introduced reform pro- posals as well. Past efforts have foundered, because the president did not sup- port them; because the DCI, the secretary of defense, or both opposed them; and because some proposals lacked merit.We have tried to take stock of these experiences, and borrow from strong elements in many of the ideas that have already been developed by others. Recommendation:The current position of Director of Central Intel- ligence should be replaced by a National Intelligence Director with two main areas of responsibility: (1) to oversee national intelligence centers on specific subjects of interest across the U.S. government and (2) to manage the national intelligence program and oversee the agencies that contribute to it. First, the National Intelligence Director should oversee national intelligence centers to provide all-source analysis and plan intelligence operations for the whole government on major problems. housed in whatever department or agency is best suited for them. at State, Defense, Homeland Security, Justice, and other agencies. Other agencies in the intelligence community would coordinate their work within each of these three areas, largely staying housed in the same departments or agencies that support them now. Returning to the analogy of the Defense Department's organiza- tion, these three deputies-like the leaders of the Army, Navy, Air Force, or Marines-would have the job of acquiring the systems, training the people, and executing the operations planned by the national intelligence centers. And, just as the combatant commanders also report to the secre- tary of defense, the directors of the national intelligence centers-e.g., for counterproliferation, crime and narcotics, and the rest-also would report to the National Intelligence Director. military intelligence program (JMIP) and the tactical intelligence and related activities program (TIARA)-would remain part of that department's responsibility. establish standards for education and training and facilitate assignments at the national intelligence centers and across agency lines. The National Intelligence Director also would set information sharing and information technology policies to maximize data sharing, as well as policies to protect the security of information. National Intelligence Director should participate in an NSC execu- tive committee that can resolve differences in priorities among the agencies and bring the major disputes to the president for decision. The National Intelligence Director should be located in the Executive Office of the President. This official, who would be confirmed by the Senate and would testify before Congress, would have a relatively small staff of several hun- dred people, taking the place of the existing community management offices housed at the CIA. In managing the whole community,the National Intelligence Director is still providing a service function.With the partial exception of his or her responsi- bilities for overseeing the NCTC, the National Intelligence Director should support the consumers of national intelligence-the president and policymak- ing advisers such as the secretaries of state, defense, and homeland security and the attorney general. We are wary of too easily equating government management problems with those of the private sector. But we have noticed that some very large private firms rely on a powerful CEO who has significant control over how money is spent and can hire or fire leaders of the major divisions, assisted by a relatively modest staff,while leaving responsibility for execution in the operating divisions. ligence collection inside the United States.Yet law and custom has coun- seled against giving such a plain domestic role to the head of the CIA. national priorities.The National Intelligence Director should not be both one of the advocates and the judge of them all. o Covert operations tend to be highly tactical, requiring close attention. mission center to oversee these details, helping to coordinate closely with theWhite House.The CIA will be able to concentrate on build- ing the capabilities to carry out such operations and on providing the personnel who will be directing and executing such operations in the field. ties of the CIA should be a full-time effort, and the director of the CIA should focus on extending its comparative advantages. Recommendation: The CIA Director should emphasize (a) rebuild- ing the CIA's analytic capabilities; (b) transforming the clandestine service by building its human intelligence capabilities; (c) developing a stronger language program, with high standards and sufficient financial incentives; (d) renewing emphasis on recruiting diversity among operations officers so they can blend more easily in foreign cities; (e) ensuring a seamless relationship between human source col- lection and signals collection at the operational level; and (f) stress- ing a better balance between unilateral and liaison operations. believe, however, that one important area of responsibility should change. Recommendation: Lead responsibility for directing and executing paramilitary operations, whether clandestine or covert, should shift to the Defense Department.There it should be consolidated with the capabilities for training, direction, and execution of such operations already being developed in the Special Operations Command. to conduct paramilitary operations with U.S. personnel. It relied on proxies instead, organized by CIA operatives without the requisite military training.The results were unsatisfactory. States cannot afford to build two separate capabilities for carrying out secret military operations, secretly operating standoff missiles, and secretly training foreign military or paramilitary forces. The United States should concentrate responsibility and necessary legal authori- ties in one entity. teams for covert and clandestine operations was a good one. We believe this proposal to be consistent with it. Each agency would con- centrate on its comparative advantages in building capabilities for joint missions.The operation itself would be planned in common. reputation for being methodical and cumbersome.We do not know if these stereotypes match current reality; they may also be one more symptom of the civil-military misunderstandings we described in chapter 4. It is a problem to be resolved in policy guidance and agency management, not in the creation of redundant, overlapping capabili- ties and authorities in such sensitive work.The CIA's experts should be integrated into the military's training, exercises, and planning. To quote a CIA official now serving in the field:"One fight, one team." Recommendation: Finally, to combat the secrecy and complexity we have described, the overall amounts of money being appropriated for national intelligence and to its component agencies should no longer be kept secret. Congress should pass a separate appropriations act for intelligence, defending the broad allocation of how these tens of bil- lions of dollars have been assigned among the varieties of intelligence work. The specifics of the intelligence appropriation would remain classified, as they are today. Opponents of declassification argue that America's enemies could learn about intelligence capabilities by tracking the top-line appropria- tions figure.Yet the top-line figure by itself provides little insight into U.S. intel- ligence sources and methods. The U.S. government readily provides copious information about spending on its military forces, including military intelli- gence.The intelligence community should not be subject to that much disclo- sure. But when even aggregate categorical numbers remain hidden, it is hard to judge priorities and foster accountability. We have already stressed the importance of intelligence analysis that can draw on all relevant sources of information. The biggest impediment to all-source analysis-to a greater likelihood of connecting the dots-is the human or sys- temic resistance to sharing information. tion information, are included, the storehouse is immense. But the U.S. gov- ernment has a weak system for processing and using what it has. In interviews around the government, official after official urged us to call attention to frus- trations with the unglamorous "back office" side of government operations. In the 9/11 story, for example, we sometimes see examples of information that could be accessed-like the undistributed NSA information that would have helped identify Nawaf al Hazmi in January 2000. But someone had to ask for it. In that case, no one did. Or, as in the episodes we describe in chapter 8, the information is distributed, but in a compartmented channel. Or the infor- mation is available, and someone does ask, but it cannot be shared. What all these stories have in common is a system that requires a demon- strated "need to know" before sharing.This approach assumes it is possible to know, in advance, who will need to use the information. Such a system implic- itly assumes that the risk of inadvertent disclosure outweighs the benefits of wider sharing.Those ColdWar assumptions are no longer appropriate.The cul- ture of agencies feeling they own the information they gathered at taxpayer expense must be replaced by a culture in which the agencies instead feel they have a duty to the information-to repay the taxpayers' investment by making that information available. Each intelligence agency has its own security practices, outgrowths of the Cold War.We certainly understand the reason for these practices. Counterin- telligence concerns are still real, even if the old Soviet enemy has been replaced by other spies. Intelligence gathered about transnational terrorism should be processed, turned into reports, and distributed according to the same quality standards, whether it is collected in Pakistan or in Texas. We propose that information be shared horizontally, across new networks that transcend individual agencies. spoke, concept. In this older approach, each agency has its own data- base. Agency users send information to the database and then can retrieve it from the database. under tremendous pressure to update their systems. Alone, they may only be able to modernize the stovepipes, not replace them. extend the system to public agencies and relevant private-sector data- bases, a government-wide initiative can succeed. issues are harder than the technical ones. The necessary technology already exists. What does not are the rules for acquiring, accessing, sharing, and using the vast stores of public and private data that may be available. When information sharing works, it is a powerful tool. Therefore the sharing and uses of information must be guided by a set of practical policy guidelines that simultaneously empower and constrain officials, telling them clearly what is and is not permitted. Few things are more difficult to change in Washington than congressional committee jurisdiction and prerogatives. To a member, these assignments are almost as important as the map of his or her congressional district.The Amer- ican people may have to insist that these changes occur, or they may well not happen. Having interviewed numerous members of Congress from both par- ties, as well as congressional staff members, we found that dissatisfaction with congressional oversight remains widespread. makers and warfighters a decisive edge in any conflict where the interests of the United States are vital. Not only does good intelligence win wars, but the best intelligence enables us to prevent them from happening altogether. Under the terms of existing rules and resolutions the House and Senate intelligence committees lack the power, influence, and sustained capability to meet this challenge.While few members of Congress have the broad knowl- edge of intelligence activities or the know-how about the technologies employed, all members need to feel assured that good oversight is happening. When their unfamiliarity with the subject is combined with the need to pre- serve security, a mandate emerges for substantial change. Whichever of these two forms are chosen, the goal should be a structure- codified by resolution with powers expressly granted and carefully limited- allowing a relatively small group of members of Congress, given time and reason to master the subject and the agencies, to conduct oversight of the intel- ligence establishment and be clearly accountable for their work. The staff of this committee should be nonpartisan and work for the entire committee and not for individual members. The other reforms we have suggested-for a National Counterterrorism Center and a National Intelligence Director-will not work if congressional oversight does not change too. Unity of effort in executive management can be lost if it is fractured by divided congressional oversight. Recommendation: Congressional oversight for intelligence-and counterterrorism-is now dysfunctional. Congress should address this problem.We have considered various alternatives: A joint committee on the old model of the Joint Committee on Atomic Energy is one. A single committee in each house of Congress, combining authoriz- ing and appropriating authorities, is another. ies of the activities of the intelligence agencies and report problems relating to the development and use of intelligence to all members of the House and Senate. subcommittee specifically dedicated to oversight, freed from the con- suming responsibility of working on the budget. should grant subpoena authority to the committee or committees. The majority party's representation on this committee should never exceed the minority's representation by more than one. should be a member who also serves on each of the following addi- tional committees:Armed Services, Judiciary, Foreign Affairs, and the Defense Appropriations subcommittee. In this way the other major congressional interests can be brought together in the new commit- tee's work. without set terms, thereby letting them accumulate expertise. sibility, and accountability, for the quality of the committee's work. The leaders of the Department of Homeland Security now appear before 88 committees and subcommittees of Congress. One expert witness (not a mem- ber of the administration) told us that this is perhaps the single largest obstacle impeding the department's successful development.The one attempt to con- solidate such committee authority, the House Select Committee on Home- land Security, may be eliminated.The Senate does not have even this. Congress needs to establish for the Department of Homeland Security the kind of clear authority and responsibility that exist to enable the Justice Depart- ment to deal with crime and the Defense Department to deal with threats to national security.Through not more than one authorizing committee and one appropriating subcommittee in each house, Congress should be able to ask the secretary of homeland security whether he or she has the resources to provide reasonable security against major terrorist acts within the United States and to hold the secretary accountable for the department's performance. In chapter 6, we described the transition of 2000-2001. Beyond the policy issues we described, the new administration did not have its deputy cabinet offi- cers in place until the spring of 2001, and the critical subcabinet officials were not confirmed until the summer-if then. In other words, the new adminis- tration-like others before it-did not have its team on the job until at least six months after it took office. Recommendation: Since a catastrophic attack could occur with lit- tle or no notice, we should minimize as much as possible the disrup- tion of national security policymaking during the change of administrations by accelerating the process for national security appointments. We think the process could be improved significantly so transitions can work more effectively and allow new officials to assume their new responsibilities as quickly as possible. members of their prospective transition teams to the FBI so that, if necessary, those team members can obtain security clearances imme- diately after the election is over. national security positions to begin obtaining security clearances immediately after the election, so that their background investigations can be complete before January 20.
taining security clearances, ensuring uniform standards-including uniform security questionnaires and financial report requirements, and maintaining a single database.This agency can also be responsible for administering polygraph tests on behalf of organizations that require them. national security team, through the level of under secretary of cabi- net departments, not later than January 20. The Senate, in return, should adopt special rules requiring hearings and votes to confirm or reject national security nominees within 30 days of their submission. The Senate should not require confirmation of such executive appointees below Executive Level 3.
sible use of force. Such a document could provide both notice and a checklist, inviting a president-elect to inquire and learn more. We have considered proposals for a new agency dedicated to intelligence col- lection in the United States. Some call this a proposal for an "American MI- 5," although the analogy is weak-the actual British Security Service is a relatively small worldwide agency that combines duties assigned in the U.S. government to the Terrorist Threat Integration Center, the CIA, the FBI, and the Department of Homeland Security. The concern about the FBI is that it has long favored its criminal justice mission over its national security mission. Part of the reason for this is the demand around the country for FBI help on criminal matters. The FBI was criticized, rightly, for the overzealous domestic intelligence investigations dis- closed during the 1970s.The pendulum swung away from those types of inves- tigations during the 1980s and 1990s, though the FBI maintained an active counterintelligence function and was the lead agency for the investigation of foreign terrorist groups operating inside the United States. We do not recommend the creation of a new domestic intelligence agency. It is not needed if our other recommendations are adopted-to establish a strong national intelligence center, part of the NCTC, that will oversee coun- terterrorism intelligence work, foreign and domestic, and to create a National Intelligence Director who can set and enforce standards for the collection, pro- cessing, and reporting of information. Under the structures we recommend, the FBI's role is focused, but still vital. The FBI does need to be able to direct its thousands of agents and other employees to collect intelligence in America's cities and towns-interviewing informants, conducting surveillance and searches, tracking individuals, work- ing collaboratively with local authorities, and doing so with meticulous atten- tion to detail and compliance with the law.The FBI's job in the streets of the United States would thus be a domestic equivalent, operating under the U.S. Constitution and quite different laws and rules, to the job of the CIA's opera- tions officers abroad. Creating a new domestic intelligence agency has other drawbacks. tion operations in compliance with the law. If a new domestic intel- ligence agency were outside of the Department of Justice, the process of legal oversight-never easy-could become even more difficult. Abuses of civil liberties could create a backlash that would impair the collection of needed intelligence. of the officials most responsible for current counterterrorism efforts while the threat remains high. Putting a new player into the mix of federal agencies with counterterrorism responsibilities would exacer- bate existing information-sharing problems. personnel.The FBI already has 28,000 employees; 56 field offices, 400 satellite offices, and 47 legal attaché offices; a laboratory, operations center, and training facility; an existing network of informants, coop- erating defendants, and other sources; and relationships with state and local law enforcement, the CIA, and foreign intelligence and law enforcement agencies. become matters that involve violations of criminal law and possible law enforcement action. Because the FBI can have agents working criminal matters and agents working intelligence investigations con- cerning the same international terrorism target, the full range of inves- tigative tools against a suspected terrorist can be considered within one agency. The removal of "the wall" that existed before 9/11 between intelligence and law enforcement has opened up new opportunities for cooperative action within the FBI. criminal investigations, such as money laundering or the smuggling of contraband. In the field, the close connection to criminal work has many benefits. Our recommendation to leave counterterrorism intelligence collection in the United States with the FBI still depends on an assessment that the FBI-if it makes an all-out effort to institutionalize change-can do the job.As we men- tioned in chapter 3, we have been impressed by the determination that agents display in tracking down details, patiently going the extra mile and working the extra month, to put facts in the place of speculation. In our report we have shown how agents in Phoenix, Minneapolis, and NewYork displayed initiative in pressing their investigations. tigation. FBI employees need to report and analyze what they have learned in ways the Bureau has never done before. Under Director Robert Mueller, the Bureau has made significant progress in improving its intelligence capabilities. It now has an Office of Intelligence, overseen by the top tier of FBI management. Field intelligence groups have been created in all field offices to put FBI priorities and the emphasis on intel- ligence into practice. Advances have been made in improving the Bureau's information technology systems and in increasing connectivity and informa- tion sharing with intelligence community agencies. Director Mueller has also recognized that the FBI's reforms are far from complete. He has outlined a number of areas where added measures may be necessary. Specifically, he has recognized that the FBI needs to recruit from a broader pool of candidates, that agents and analysts working on national secu- rity matters require specialized training, and that agents should specialize within programs after obtaining a generalist foundation.The FBI is developing career tracks for agents to specialize in counterterrorism/counterintelligence, cyber crimes, criminal investigations, or intelligence. It is establishing a program for certifying agents as intelligence officers, a certification that will be a prerequi- site for promotion to the senior ranks of the Bureau. New training programs have been instituted for intelligence-related subjects. The Director of the FBI has proposed creating an Intelligence Directorate as a further refinement of the FBI intelligence program.This directorate would include units for intelligence planning and policy and for the direction of ana- lysts and linguists. We want to ensure that the Bureau's shift to a preventive counterterrorism posture is more fully institutionalized so that it survives beyond Director Mueller's tenure.We have found that in the past the Bureau has announced its willingness to reform and restructure itself to address transnational security threats, but has fallen short-failing to effect the necessary institutional and cul- tural changes organization-wide.We want to ensure that this does not happen again. Despite having found acceptance of the Director's clear message that counterterrorism is now the FBI's top priority, two years after 9/11 we also found gaps between some of the announced reforms and the reality in the field. We are concerned that management in the field offices still can allocate peo- ple and resources to local concerns that diverge from the national security mis- sion.This system could revert to a focus on lower-priority criminal justice cases over national security requirements. culture imbued with a deep expertise in intelligence and national security. to develop this intelligence cadre. national security disciplines is vital to the success of both missions, all new agents should receive basic training in both areas. Furthermore, new agents should begin their careers with meaningful assignments in both areas. and have the option to work such matters for their entire career with the Bureau. Certain advanced training courses and assignments to other intelligence agencies should be required to advance within the national security discipline. ing those working on law enforcement matters, should be certified intelligence officers. process for agents and analysts that enhances its ability to target and attract individuals with educational and professional backgrounds in intelligence, international relations, language, technology, and other relevant skills. surveillance personnel in the field so that a dedicated team approach is brought to bear on national security intelligence operations. for national security matters.This individual would have management oversight and ensure that the national priorities are carried out in the field. gram reviews designed to identify whether each field office is appro- priately addressing FBI and national program priorities. cations, status, and roles of analysts in the field and at headquarters. Congress should ensure that analysts are afforded training and career opportunities on a par with those offered analysts in other intelligence community agencies. information-sharing principles are implemented in practice. The FBI is just a small fraction of the national law enforcement commu- nity in the United States, a community comprised mainly of state and local agencies.The network designed for sharing information, and the work of the FBI through local Joint Terrorism Task Forces, should build a reciprocal rela- tionship, in which state and local agents understand what information they are looking for and, in return, receive some of the information being developed about what is happening, or may happen, in their communities. In this rela- tionship, the Department of Homeland Security also will play an important part. rity.They must have clear delineations of responsibility and authority. rorists might turn to hijacking and even use of planes as missiles.We have been assured that NORAD has now embraced the full mission. Northern Com- mand has been established to assume responsibility for the defense of the domestic United States. Recommendation: The Department of Defense and its oversight committees should regularly assess the adequacy of Northern Com- mand's strategies and planning to defend the United States against military threats to the homeland. The Department of Homeland Security was established to consolidate all of the domestic agencies responsible for securing America's borders and national infrastructure, most of which is in private hands. It should identify those elements of our transportation, energy, communications, financial, and other institutions that need to be protected, develop plans to protect that infra- structure, and exercise the mechanisms to enhance preparedness. This means going well beyond the preexisting jobs of the agencies that have been brought together inside the department. Recommendation: The Department of Homeland Security and its oversight committees should regularly assess the types of threats the country faces to determine (a) the adequacy of the government's plans-and the progress against those plans-to protect America's critical infrastructure and (b) the readiness of the government to respond to the threats that the United States might face. We look forward to a national debate on the merits of what we have recom- mended, and we will participate vigorously in that debate.